​The Benefits of a Session in our Himalayan Salt Therapy Room with Halogenerator. ​Taking wellness to another level, halotherapy—a.k.a. salt therapy—remains a top spa trend. (Halo is Greek for salt.) Salt therapy is similar to spending time in the salty sea air, which offers many more benefits than just relaxation on the beach. Similar to a meditation session, you breathe deeply while listening to calming music and focusing on enjoying the benefits of the salt crystals. The pure environment is precisely balanced with 40 to 50 percent humidity and 70 to 75 degrees F temperatures. The average service costs$20 and lasts 20 minutes. ​Please make sure you call for Appt: 805-748-4930 Open Sat. from 9-1. ​ Understanding the concept of Ayurveda. This is a class for those who have never really delved into this healing philosophy. This is a bare bones intro. You will come away with a knowledge of how to take this information into your everyday lives and to feel healthier, happier and ready to learn more. From the Ayurvedic perspective, human beings are not viewed as mere thinking physical machines, but rather as fields of intelligence in dynamic exchange with the energy and information of the environment. Health is a state of vibrant balance in which all layers of one's life are integrated. Tim Costa: Singing bowl sound baths- Held the second Sunday of each month. 6 PM. Journey to the Source as you relax to the sounds of 7 Crystal Bowls, Tibetan Bowls ,Gongs and other instruments played by Tim Costa. Green Lotus Oils will be provided and please arrive at 5:30 if you'd like to enjoy herbal tea and get cozy in your space. We are accepting 20 students. All supplies are provided as well as some yummy meals. Lodging is not included. Click on the above "Events and Workshops" tab to sign up! See you soon! 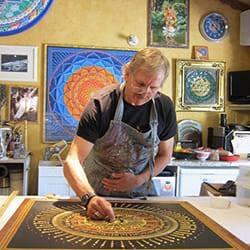 The practice of painting is healing and meditative. No experience is necessary as we transform our everyday consciousness into the inner artist that lives in each of us. The week is designed to introduce the possibility that you are an artist, and that the artist path is one of joy, insight, and awareness. It’s amazing that in just a few days, you can finish a colorful painting that reveals many of the deep inner patterns that connect you with your soul. After seeing mandalas made during Paul’s workshop, Eckhart Tolle commented, “These paintings carry a healing presence.” Deepak Chopra said, “These paintings are archetypal manifestations of higher consciousness.” After the workshop, you will have the foundation for painting sacred art and mandalas at home, as you continue on this path of self-discovery and the newfound relationship to art and your soul. Click on the Events and workshops tab above to sign up. Class limited to 20. Hurry and reserve your place! Meditation is not a way of making your mind quiet. It's a way of entering into the quiet that is already there. Buried under the 50,000 thoughts the average person thinks every day.